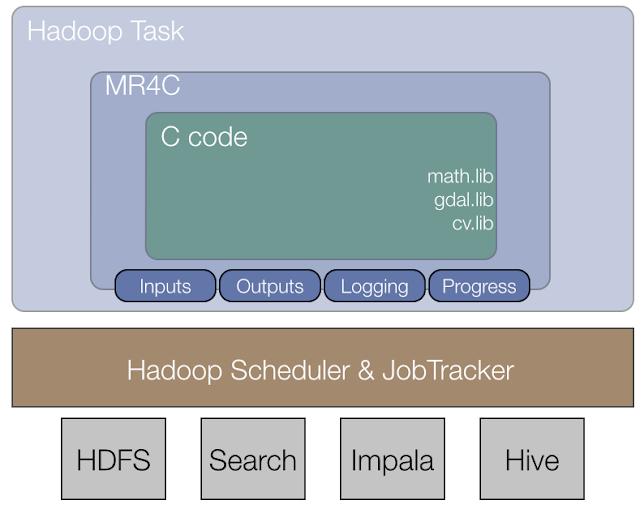 (MR4C), an open source framework that allows you to run native code in Hadoop. MR4C was originally developed at Skybox Imaging to facilitate large scale satellite image processing and geospatial data science. We found the job tracking and cluster management capabilities of Hadoop well-suited for scalable data handling, but also wanted to leverage the powerful ecosystem of proven image processing libraries developed in C and C++. While many software companies that deal with large datasets have built proprietary systems to execute native code in MapReduce frameworks, MR4C represents a flexible solution in this space for use and development by the open source community. If this sounds interesting to you, get started with our documentation and source code at the MR4C GitHub page. The goal of this project is to abstract the important details of the MapReduce framework and allow users to focus on developing valuable algorithms. Let us know how we're doing in our Google Group. We are pleased to announce the release of MapReduce for C (MR4C), an open source framework that allows you to run native code in Hadoop.